The Perfect Tortilla Pan is a new non-stick tortilla mold that lets you makes perfectly shaped tortilla bowls at home. You can enjoy the same great tortilla bowls that you get at restaurants. The difference though is that the Perfect Tortilla lets you make healthier tortillas. This is because they are baked and not fried. So you and your family can enjoy a tortilla bowl without the extra oil and fat. The special design of the Perfect Tortilla molds are non-stick and dishwasher safe. You’ll can use them to easily create crispy restaurant style tortilla bowls at home. First you just place at kind of tortilla shell inside the Perfect Tortilla and press it against the edges. The Perfect Tortilla is designed to work with tortillas of all different sizes. Then just pop the Perfect Tortilla inside the oven and set to around 5 minutes or so. After it is done you’ll have a perfect golden brown and crispy tortilla bowl. You could then just slide it right out since the mold is non-stick. Use the Perfect Tortilla pan to create of types of different tortillas bowl dishes whether it is a chili bowl, taco fiesta bowl, shrimp bowl, a salad bowl, a dip bowl, a desert bowl and much more. The included Recipe Guide comes with tons of different ideas. A set of 2 Perfect Tortilla Molds and a Recipe Guide normally sells for $10 plus shipping but currently there’s a buy 1 get 1 free offer available. 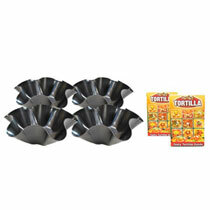 You can get a second set of 2 Perfect Tortilla Molds and Recipe Guide for free by paying the additional shipping cost. Plus as an added bonus you’ll receive a free Cut ‘n Cup Slicer that is valued at $20 to go along with your order. It is measuring cup that you use to cut, slice and dice vegetables, fruits, or cheeses. One Comment on "Perfect Tortilla Pan"
I bought a set of these and used them tonight for the first time. Really love them. I know oven temps differ but 400 degrees proved to be a bit hot. The tops hanging over the top of the pan browned very quickly but they held their form. I used the buritto sized tortillas. I turned the temp down and they browned nicely.